Cameras shown in the map are exclusively traffic control , they are not recording ones. For security reasons, videos are not displayed,in this web only several captures cyclically generated with an aleatory and enough time delay are shown. Date and hour of the captured image will appear on the top corner of the photograph. If you find any failure in one of the cameras, please get in touch with us sending an e-mail to cgim@movilidadgranada.com. In only one point may appear up to 4 cameras showing different traffic moves of the intersection. To help camera viewing, we have incorporated a scroll that let you to watch all the cameras in that poing. To improve the information on the camera map it has been included different icons that shows if in each position exists one camera or more and the direction focused. In the previous grid you can watch cameras ordered from North to South. 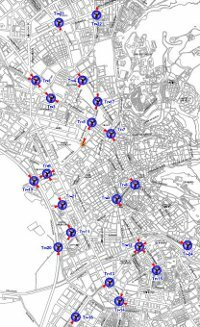 To ease traffic control cameras viewing, we have developed a “usual routes” collection in the city that allow users to see their most relevant cameras all at once.